The fourth tactical implication identified in the Underwriters Laboratories study of the Impact of Ventilation on Fire Behavior in Legacy and Contemporary Residential Construction (Kerber, 2011) is that fire attack and (tactical) ventilation must be coordinated. This recommendation has been repeated in National Institute for Occupational Safety and Health (NIOSH) Death in the Line of Duty Reports for many years. In fact, most reports on firefighter fatalities related to rapid fire progression contain this recommendation. 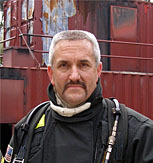 Coordination of (tactical) ventilation and fire attack as a tactical implication is closely related to the first two tactical implications identified in the UL study; potential changes in fire behavior based on stages of fire development, burning regime, and changes in ventilation profile that increase oxygen supplied to the fire. 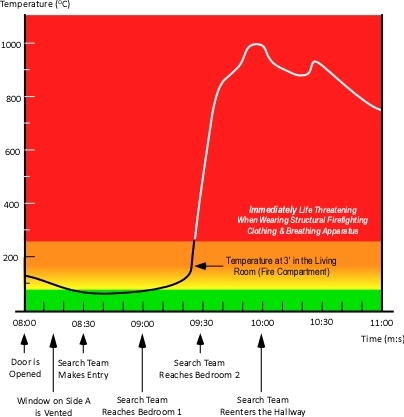 The Impact of Ventilation on Fire Behavior in Legacy and Contemporary Residential Construction Underwriters Laboratories (UL) on-line course and report provide an example of firefighters are at risk when ventilation is performed prior to entry, fire attack is delayed, and other tactical operations such as primary search are initiated. In UL’s hypothetical example, the firefighters make entry into the one-story house, search the living room (fire compartment), the kitchen, and dining room shortly after forcing the door and ventilating a large window in the fire compartment. Consider a somewhat different scenario, with the same fire conditions. Companies respond to a residential fire with persons reported during the early morning hours. A truck and engine arrive almost simultaneously and while the engine lays a supply line from a nearby hydrant, the truck company forces entry, ventilates a window on Side A, and begins primary search (anticipating that the engine crew will be right behind them to attack the fire). The engine completes a forward lay and begins to stretch an attack line after the search team has made entry. 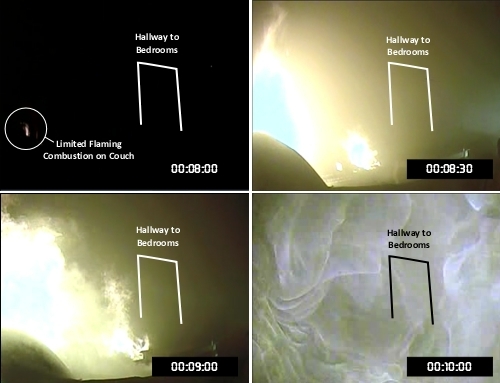 As illustrated in Figure 3, visible flaming combustion when the door is opened at 08:00 is limited to a small flame from the top of the couch just inside the door on Side A. However, in the 30 seconds that it takes for the search team to make entry, flaming combustion has resumed and flames are near or at the ceiling above the couch. 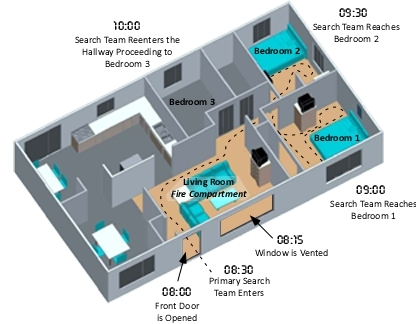 The search team may estimate that they have time to complete a quick search of the bedrooms (likely location of the reported persons). However, fire development progresses to untenable conditions within a minute, trapping the crew on Side D of the house. As the search team completes primary search of Bedroom 2 and moves towards Bedroom 3 in the hallway, conditions have deteriorated to an untenable level. Figure 4 illustrates the change in temperature at the 3’ level in the Living Room (fire compartment). Shortly before the search team reached Bedroom 2, fire conditions in the living room began to change dramatically, with temperature at the 3’ level transitioning from ordinary to extreme, quickly becoming untenable in the living room, hallway and adjacent compartments. In addition to this significant change in temperature, flames (with temperatures higher than the gas temperature at the 3’ level) significantly increase radiant heat transfer (flux) to the surface of both fuel packages and firefighters protective equipment. Note: Figure 4 illustrates temperature conditions starting eight minutes after ignition. The fire previously progressed through incipient and growth stages before beginning to decay due to lack of ventilation. Why the Dramatic Change in Conditions? As discussed in UL Tactical Implications Part 1, Fires in the contemporary environment progress from ignition and incipient stage to growth, but often become ventilation controlled and begin to decay, rather than continuing to grow into a fully developed fire. This ventilation induced decay continues until the ventilation profile changes (e.g., window failure due to fire effects, opening a door for entry or egress, or intentional creation of ventilation openings by firefighters. When ventilation is increased, heat release rate again rises and temperature climbs with the fire potentially transitioning through flashover to the fully developed stage (see Figure 4 and 5). Captain James Mendoza of the San Jose (CA) Fire Department and CFBT-US Lead Instructor demonstrates the influence of ventilation on fire development using a small scale prop developed by Dr. Stefan Svensson of the Swedish Civil Contingencies Agency. The prop used in this demonstration is a small, single compartment with a limited ventilation opening on the right side (which in a full size building could be represented by normal building leakage or a compartment opening that is restricted such as a partially open door or window). The front wall of the prop is ceramic glass to permit direct observation of fire conditions within the compartment. As you watch this demonstration, pay particular attention to how conditions change as the fire develops and then enters the decay stage. In addition, observe how quickly the fire returns to the growth stage and develops conditions that would be untenable after the window is opened at 12:17. Download Doll’s House Plans (or Doll’s House Plans: Metric) for directions on how to construct a similar small scale prop. Fire development and changes in conditions following ventilation in this demonstration mirror those seen in the full scale experiments conducted by UL. Increasing ventilation to a ventilation controlled fire, results in increased heat release rate and transition from decay to the growth stage of fire development. The same phenomena can be observed under fireground conditions in the following video clip of a residential fire in Dolton, Illinois (this is a long video, watch the first several minutes to observe the changes in fire behavior). It appears that the front door was open at the start of the video clip and the large picture window on Side A was ventilated at approximately 00:47. Fire conditions quickly transition to the growth stage with flames exiting the window and door, causing firefighters on an uncharged hoseline that had been advanced into Floor 1, to quickly withdraw. Fires that have progressed beyond the incipient stage are likely to be ventilation controlled when the fire department arrives. Ventilation controlled fires may be in the growth, decay, or fully developed stage. Regardless of the stage of fire development, when a fire is ventilation controlled, increased ventilation will always result in increased HRR. Firefighters and fire officers must recognize that the ventilation profile can change (e.g., increasing ventilation) as a result of tactical action or fire effects on the building (e.g., window failure). Firefighters and fire officers must anticipate potential changes in fire behavior related to changes in the ventilation profile and ensure that fire attack and ventilation are closely coordinated. Understanding how fire behavior can be influenced by changes in ventilation is essential. But how can firefighters put this knowledge to use on the fireground and what exactly does coordination of tactical ventilation and fire attack really mean? Tactical ventilation can be defined as the planned, systematic, and coordinated removal of hot smoke and fire gases and their replacement with fresh air. Each of the elements of this definition is important to safe and effective tactical operations. Ventilation (both tactical and unplanned) not only removes hot smoke, but it also introduces fresh air which can have a significant effect on fire behavior. Tactical ventilation must be planned; these two elements speak to the intentional nature of tactical ventilation. Tactics to change the ventilation profile must be intended to influence the fire environment or fire behavior in some way (e.g., raise the level of the upper layer to increase visibility and tenability). The ventilation plan must also consider the flow path (e.g., vent ahead of, not behind, the attack team; vent in the immediate area of the fire, not at a remote location). Tactical ventilation must be systematic, exhaust openings should generally be made before inlet openings (particularly when working with positive pressure ventilation or when taking advantage of wind effects). Sequence: Ventilation may be completed before, during, or after fire attack has been initiated. Sequence will likely depend on the stage of fire development, burning regime, time required to reach the fire. In general, when the fire is ventilation controlled (as those beyond the incipient stage are likely to be), ventilation should not be completed unless the attack line(s) can quickly apply water to the seat of the fire. In a small, single family dwelling this may mean that the attack team is on-air, the line is charged, and the entry door is unlocked or has been forced and is being controlled (held closed). In a larger building, this may mean that the attack line has entered the structure and is in position to move onto the fire floor or into the fire area. What influence will these ventilation tactics have on fire behavior? Are charged and staffed attack line(s) in place? Will the attack team(s) be able to quickly reach the fire? How will this impact crews operating on the interior of the building? Coordination requires clear, direct communication between companies or crews assigned to ventilation, fire attack, and other tactical functions that are or will be taking place inside the building. Important: While not a tactical implication directly raised by the UL study, another important consideration is the hazard of working without or ahead of the hoseline. While a controversial topic in the US fire service (where truck company personnel generally work on the interior without a hoseline), searching with a hoseline provides a means of protection and a defined exit path. Staffing is another key element of the operational context. If you do not have enough personnel to control the fire and search; in most cases it is likely the best course of action to control the fire and ensure a safer operating environment for search operations. The next tactical implication identified in the UL study (Kerber, 2011) examines information that may be obtained by reading the air track at the entry point opening. This implication will be expanded with a broader discussion of air track indicators and how related hazards can be mitigated to improve firefighter safety. As discussed in UL Tactical Implications Part 1 [LINK], Fires in the contemporary environment progress from ignition and incipient stage to growth, but often become ventilation controlled and begin to decay, rather than continuing to grow into a fully developed fire. This ventilation induced decay continues until the ventilation profile changes (e.g., window failure due to fire effects, opening a door for entry or egress, or intentional creation of ventilation openings by firefighters. When ventilation is increased, heat release rate again rises and temperature climbs with the fire potentially transitioning through flashover to the fully developed stage (see Figure 4 and 5).